Our chimpish ancestors were superbly adapted to a life of leaping through the trees. To survive on the savannah, they had to make a social leap - a change that drives us still today. Human psychology is rife with contradictions: We work hard to achieve our goals, but when we succeed, our happiness is fleeting compared with our efforts. We hope our friends will do well in life, but can’t help feeling jealous if they do too well. We’re aghast at the thought of people we know being murdered, even if we despise them, but are unconcerned when our armed forces kill enemies who are strangers to us. We complain about difficult bosses, but are often behave just as badly when we’re in charge. These inconsistencies may seem irrational, but each of them has evolved to serve a vital function in our lives. Indeed, the most fundamental aspects of our psychology were permanently shaped by the ‘social leap' our ancestors made from the rainforest to the savannah. In their struggle to survive on the open grasslands, our ancestors prioritised teamwork and sociality over physical prowess, creating an entirely new kind of intelligence that forever altered our place on this planet. 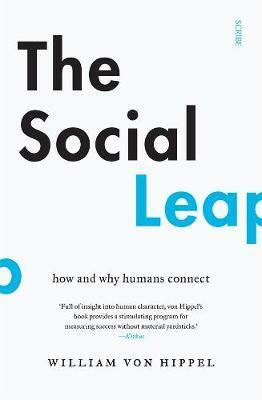 In The Social Leap, leading psychologist William von Hippel traces our evolutionary history to show how events in our distant past continue to shape our lives today. From the everyday, such as why we exaggerate, to the exotic, such as why we believe our own lies, the implications are far-reaching and extraordinary. Blending anthropology, biology, history, and psychology with evolutionary science, The Social Leap is a fresh, provocative look at our species. It provides new clues about who we are, why we do what we do, and how to live the good life.